Received as Mother's Day gift in 2014 and immediately devoured it. Two years later it is still a recommended read. Enjoy the review; didn't change a word for the original post! 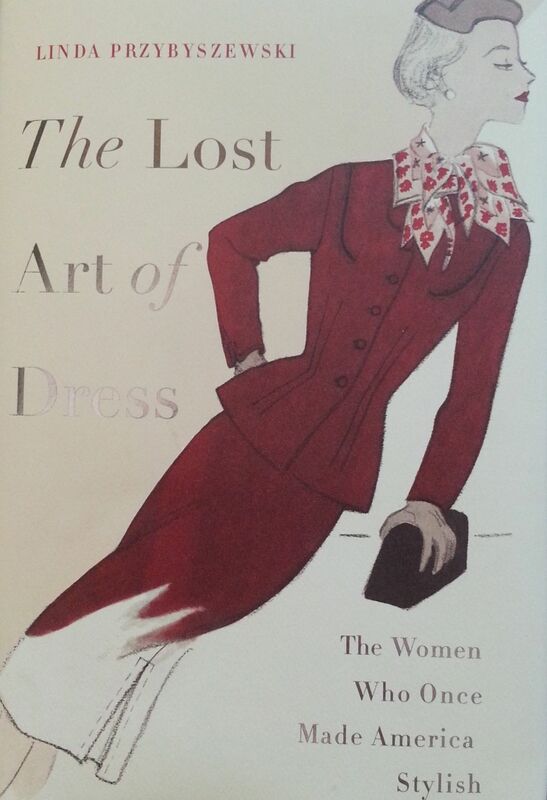 The Lost Art of Dress--The Women Who Once Made America Stylish by Linda Przybyszewski. What a book it is; 288 pages, illustrations, 33 pages of notes and 15 pages of index. This is a textbook, history book, reference book; not the casual read one would expect. Don't be put off by it's textbook format as it is so much more. The Lost Art of Dress is a fascinating, readable, intellectual treatise on women's dress in America. I recommend it as an enjoyable, educational summer read. This is a book about 'former' American fashion style: what it was and is, how America got it, and how we might have it again. And, oh yes, why we need it. It is also a comprehensive history of the women (Linda calls them Dress Doctors) who started the movement and why they ended up in Home Economics at colleges and the USDA when they really wanted careers in the Sciences. A great plus for the book, in my opinion, is that it documents woman's struggle for equality, long before women won the vote. You might expect this book to promote a return to an earlier age of American dress. So it does, but acknowledges 21st century lifestyle changes. Let's admit it, Americans are slobs, e.g., sweatshirts and flip flops to the office? No wonder businesses institute dress codes. We have swung to the opposite end of the continuum and now need to get to somewhere in the middle. Linda suggests we do that by finding current day Dress Doctors to show us the way. Happily, Linda's Dress Doctors are not as rigid as my encounters at the College of Home Economics, University of MN. I graduated in 1963, and even then, jeans and pants were acceptable college attire. BUT, not at the College of Home Economics. We were required to wear skirts even though we changed before and after class as tromping across snow-covered campus just wasn't comfortable or practical. And we were also coached to respond to an offer of coffee (on these home visits) with, "Thank you, a glass of water will be just fine." I Kid You Not! Would I make something like that up? Have no idea what that was all about: Keep us humble? We weren't entitled to anything better than water???? There were times when I hooted, although I must confess, a lot of the humor is of the Insider variety--Insiders being sewists, home economists, fashionistas. An example from the very first chapter refers to a woman who wrote to a farm journal editor in 1857, arguing that women needed sewing machines as much as men needed farm machinery; this after said editor wished he had never written about sewing machines because he was inundated with letters asking for more. Linda's aside wonders if the woman's husband "had been acting mulish about such a purchase." I sadly chuckled as 150+ years later, wives are still facing opposition about the high price of sewing machines and ,"Why do you need a new machine, that one works just fine." This, when a new boat shows up in the garage every two years and displaces a car--guess whose car! I speak from experience. Another part I particularly enjoyed was the history of home economists (I am one) . These were women, often with chemistry college degrees, with nowhere to use them--a woman in a laboratory? Horrors! In 1923, home economists got their own bureau at the USDA. Finally, women college graduates had a place to go. But it wasn't a bed of roses as it was often suggested that... "'girl chemists' learn to type instead of aiming for jobs in laboratories." That condition strikes a cord with me as by 1959, the year I graduated from high school, career opportunities for women hadn't changed all that much. 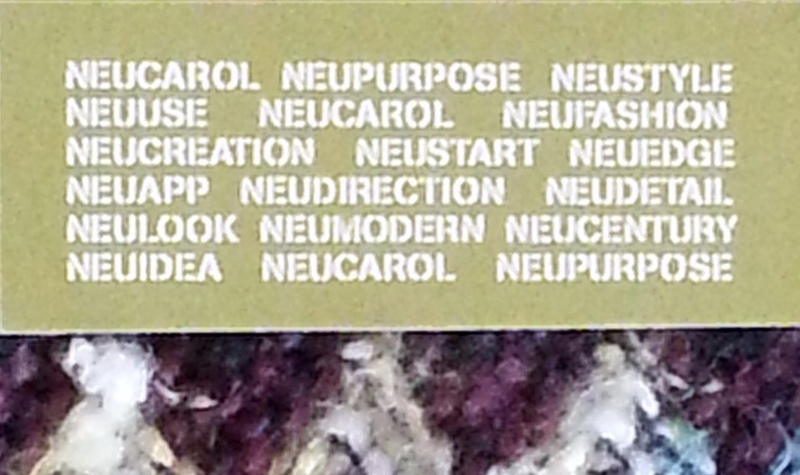 My high school counselor had these 'job' suggestions: nurse, teacher, secretary. The unspoken was marriage or factory work at the local 3M plant. Note the word choice of Job vs Career. There was a certain denigrating connotation to the word 'job' as it related to women. "The bureau's Food and Nutrition Division tended to get more press coverage than Textiles and Clothing--which makes sense, since botulism can kill you, while an ugly dress only makes you wish you were dead..."--also a telling criticism of the importance of clothing, fashion. As to the importance of dress, Ms. Przybyszewski relates the story of a woman Doctor who, in 1918, sought help as people did not respect her intelligence due to her poor dress and she had no knowledge of appropriate wardrobe. This woman exhibited her intelligence by recognizing the problem and seeking professional help--problem solved. Chapter 2: Art: Principles for Beauty is a review of how and when standards for appropriate dress were developed in America. Ms. Przybyszewski goes back to sumptuary laws of Renaissance Europe that provided a way to recognize social class based on dress--particularly whores. Seems to me that in the 21st century, dress rules have gone amok as the whore is eagerly emulated in dress and manner, e.g., entertainers, street style. As a student in Home Economics Education at the University of MN in the early '60s, I was introduced to The Goldsteins (they are still referred to with great reverence and with capital letters) in the required Intro to Related Art I & II . 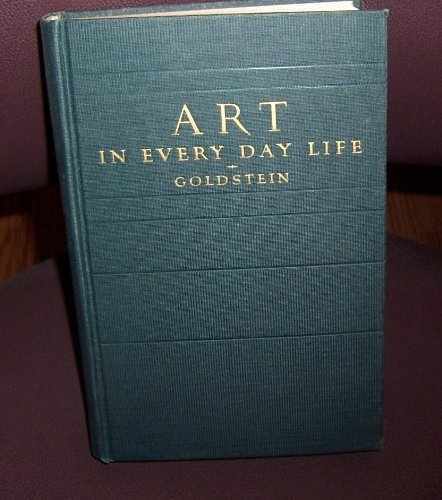 Although The Goldsteins had retired in 1949, the final 1954 edition, was the text book. Every text book on dress since has borrowed from Art in Every Day Life. The book is still available on Amazon. Apparently the original book is priced at $2432.64, used at $7.00. I'm madly digging through boxes of books (never unpacked from last move) for my copy. Haven't found it yet, but did find several yearbooks and at least 10 dictionaries; two were 8" thick and weigh several pounds. They now have nice homes at the local library, probably in the book sale. The last chapter is a waggish review of patterns,--the skirt made from ties collected from men the wearer slept with, the dish towel dress (luckily I missed that one)--age appropriate dress and what was deemed age appropriate (at one time, only after age 25 were 'sophisticated styles' appropriate), and sizing, which apparently varies depending on the garment cost--the more expensive, the smaller the size.